Caroline’s career is really interesting and I’ve wanted to talk to you about her for a long time now. Not only because she’s as funny as she is brilliant, but also because her career path was anything but linear. By the end of the interview, she’ll tell us how she went from finance to the front rows of the runway shows, what it means to be streetstyle blog darling and what an adventure it was to take on Tank, an independent art and fashion magazine based in London. All that, plus this look that I just adore (a hoodie plus those dangly earings, so cooooool! ), it’s getting a little out of hand today on this here blog. Ooookay! Come take a walk with Caroline!!! Big hugs! What’s your official title at Tank? I’m the publisher and fashion director at Tank. I was always interested in business! I had the opportunity to go to an amazing undergraduate business school in the states called Wharton (Caroline is from Montreal). It was full of nerds and I was one of them! I studied entrepreneurship and strategy. And what was your first job? After I graduated, I joined a small management and consulting firm in San Francisco. I got to work for their retail clients–my first one was Nordstrom–helping with their petite and plus size strategy. I moved to Texas and helped with the acquisition of Snapple for Dr. Pepper. Then they moved me to Singapore, where my mom was from. There I worked on a financial services client and…that’s when I decided I hated financial services! I didn’t want to be reading books about mortgages on the weekends!! How did Tank become part of the picture? And that’s what I did. I joined Tank in mid 2002 so it’s almost been 10 years now, and it’s the best decision I ever made in my life. How would you describe what you do at Tank? Well, we have a couple of our own publications. Tank is quarterly. Then there’s BecauseLondon, which is daily. On top of all of that, we have a dozen of clients through our consulting agency, Tank Form, at any given time. So it’s shooting an ad campaign or developing a web shop, which we just did for Vivienne Westwood. We also do custom magazines for brands like Levi’s. Wow! That sounds like a lot. So what’s an average day like? Literally I work 12 jobs in a day and across 10 projects in a week. I’m between having meetings with the fashion team at Tank, to commissioning writers, or coming up with a new strategic platform for a new brand. It’s so varied and that’s why I love what I do. Tank is more than a fashion magazine. How do you find the right balance between art and fashion? It’s a hefty enough magazine that we can cover architecture, art music, and fashion with what we’d like to think is credibility and weight. How do you feel about covering celebrities in magazines? We’ve never really gone down the celebrity route. The kind of “celebrities” that we would put (there’s only been 3 or 4 recognizable faces in our 14 years of Tank) people wouldn’t even recognize! For us, celebrities are famous architects or interesting artists or people who do interesting things, it’s not necessarily the People or the US magazine celebrities that we go for. If you could shoot anyone for Tank, who would it be? How do you fund the magazine? It’s self-financed. When Masoud and his founding partner started the magazine, they only printed 6,000 copies and sold them out of the back of a truck. It’s 13 and a half years later now, and we’ve been really lucky to have loyal readers who buy the magazine on the newsstands, as well as a small amount of loyal advertisers. It’s actually the reverse of any sane publishing group. All of the big magazines make their money through huge amounts of advertising and the newsstand sales are icing on the cake, where for us it’s the reverse. How do Tank and Tank Form work together? It’s a tough place, because when we sell a copy in Shanghai, Tank gets the margin a year later. That really pushed the agency to grow really quickly, which is lucky because it’s also helped fund the magazine. Brands came to Tank because they really loved our point-of-view in the magazine, so they would ask us for some art direction or to work on a specific project. When I came on board, it was to develop the agency side with people who could support the bigger projects and still do the magazine despite the other work that was going on. The magazine is something we do out of passion and love and we’re lucky we work with great clients because it’s helped Tank to grow organically. The internet is so fast and economical…why do you continue to do print? I don’t think print will ever go away. At Tank we focus less on news and try to make it about the things that will last and stand the test of time. The thing is, nobody really knows what the right business model for online is. So I think our biggest challenge right now is figuring out what is the right business model for online and for print. We want Tank to be a piece of cultural history that people want to buy and keep in their homes and take with them when they move flats. And now… Time to interview the celebrity !!! You’ve always been one of my favorite people to shoot for the blog! How has becoming a street style icon affected your work? I think the biggest impact has been around helping Tank and BecauseLondon, getting people either interested in it again or to discover it for the first time. Fashion week is just around the corner… Do you think it’s important to sit in the front row? Fashion show seating is a bit of a mystery. If brands don’t like your magazine, you don’t get invited to their show or you get the nosebleed seats and you can’t really see anything. So what’s the point of going? Maybe we could have a fashion show viewing party where we sit in front of the computer and eat a bag of donuts, like a football game! One of them would be the Dior Couture show at Versailles. Fashion is very much a fantasyland and one of the amazing parts of this job is becoming part of that fantasy. You’re always so calm and smiling during the shows… How do you manage to stay so cool with all of the hysteria around fashion week? You have to remember there’s a bigger picture. If you can read a newspaper every day and have a bigger perspective than the fashion bubble that exists, you become much more aware that fashion isn’t your whole life. You’ve been in Vogue quite a bit recently, what are the perks and the pressures of being a public figure? I’ve never thought about my hair so much, honestly it’s driving me insane! I never dyed my hair, so I’ve got my white hairs coming out, my hair is like a complete frizz nest, for the first time I’m like, “Oh gosh! I really think I should do something with this hair of mine!” I’ve been trying all sorts of things to make it as glossy and as shiny as possible, but I think that I might need to seek professional help now. The perk has been being invited to more fashion dinners (and eating yummy food, which I guess is not so good for the fashion industry) and getting to meet interesting people! I know a lot of young people who are eager to start their own magazines. What advice would you give them? Just sticking to your point of view and making sure whatever you put out has a very specific point of view. And that the people you work with really share that point of view. That, and getting a great team. We have 22 people in our studio now. But you need a great publisher, you need a great creative director, and you need a great editor. Those 3 people will see you through years of ups and downs. Well, I would like to be the next SI Newhouse (The chairman & CEO of Condé Nast). But, I want to be the next SI Newhouse with an on-line and print marriage that’s future proof. Ok ! So I think you know a little more about her work – I find it super cool… Well maybe it’s because mine is a little bit the same (except we’re much less than 22 at Garance Dore Studio !). If you have other questions for Caroline, you can ask them in the comments or on Facebook, I love to bother her with my million questions. And if you want to know more about other careers, fashion or not, just make your suggestions ! I am listenning ! Check out my other career posts here !!! thank you Garance :) !!! Je suis amoureuse de ton blog, rien à voir avec l’article (enfin,si.) mais je tenais à te le dire. Tu es fascinante et je suis admirative de tout ce que tu fais ! Merci merci merci ! Merci beaucoup pour ce portrait et cet interview Garance. Je ne connaissais pas Tank, je vais me rattraper de suite ! Always always love the interview feature, I always want to know how people build up their careers!! I would like to hear more from the behind the scene of the fashion industry -people who work in fashion but dun get invited to glamorous fashion dinner! Merci beaucoup pour ce post. Tu ne peux pas savoir à quel point il raisonne en moi & me donne la force de m’accrocher à ce projet dingue de suivre cette route qui vous permet de laisser le monde de la finance & de la stratégie d’entreprise de côté pour la mode & le journalisme. J’ai lancé mon blog il y a 2 mois à peine. Le 2 décembre 2011…je devrais fêté ça d’aillerus :-). Cela me semble à des années lumières…combien de moments d’hésitation, de paralysie de peur de dévoiler ce côté que mes collègues auraient considérés comme futile…mais voilà, je me suis lancée et j’ai l’impression d’avoir pris mon envol. Toi comme elle êtes des anges à votre façon, car vous nous permettez de garder cet espoir fou que nous pourrions nous aussi y arriver. Vivre de notre passion & laisser notre créativité prendre le pas sur le reste…le bonheur, c’est de là que je le tire! moi je voudrais juste savoir où elle a trouvé son sweat et ses boucles d’oreilles… Et sinon, belle leçon d’alliance entre l’art, le commerce et la créativité; cette interview. Fantastic! I really love this interview series; it is so great to “meet” the intelligent women behind fashion. Thanks, Garance. Alors, mâchoire qui tombe…Quoi dire?! C’est un vrai bonheur de lire l’interview d’une modeuse professionnel qui prend autant au sérieux le fond et la forme. Avoir l’occasion de tomber sur un leader qui plus est une femme (ce qui est assez rare dans le milieu de la presse pour être souligné au stabilo boss orange fluo!!!) qui parle de son parcours (genre il faut bosser et pas que remplir son dressing), c’est juste woooaoo, un exemple à suivre en sommes! I’ve had a similar, non-linear career. Minus the glamour of the runway & Vogue. Really nice interview, thank you for letting me know more about this talented young woman! Love this as I am a young graduate wanting to launch a career in fashion and have always found it interesting what ways people choose- Thank you Garance! I would love to hear more about working in fashion events/marketing or writing. Quel plaisir de lire ce genre d’article qui montre si bien que la mode n’est pas que paillette et cercle fermé. Que ceux qui la font sont aussi des personnes qui ont de véritables valeurs, celle du travail et de l”humain, qui sont capables de prendre des risques pour faire vivre leurs convictions et de ré-inventer chaque jour ce qu’elles sont et ce qu’elles font. On ne devrait jamais minimiser le pouvoir de ceux qui apportent du beau au quotidien. Garance merci beaucoup pour ca! I would like to know more about the profession of buyers, if possible – eg. what do they do exactly besides buying for departmental stores/multi-label boutiques. How to become a buyer? What are the things a buyer should know? What traits should one have? And to Caroline – are you still heavily involved in consulting jobs for brands? What advice would you give to small indie clothes boutiques? I love hearing about fellow Montrealers who have flown the coop and have amazing careers! Thx for a great interview Garance. Il me semble qu’elle répond à une question sur les cheveux à la question sur les photos Vogue … une interview passionnante, comme d’habitude, Merci Garance! Faudrait que tu in-ter-vie-wes (vive google, l’enfer ce mot) un bon rédacteur en chef, un bon rédacteur artistique et un très bon éditeur ! Mais cette fois, please, demande leur bu-si-ness (bu et pas bi) plan. LOVE Caroline! What an inspiration!! Fabulous! I just love her. She’s beautiful and her style is impeccable – never a missed step. Les interviews de personnes créatives qui réussissent, c’est aussi ce que je trouve le plus passionnant ! Même si mon blog n’est pas tout à fait sur le même sujet que toi (bien qu’on partage le goût pour la mode, le style et les rencontres), tu es une grande source d’inspiration pour mes diverses entreprises (et notamment mon blog by louise*sk) !! Thanks for covering such a cool girl! And the post coincides perfectly for me, I recently took the role of copy editor/ administrator/social media coordinator for a small newspaper – and organization is.. ah well i’m a disaster. I was hoping to get some advice from Caroline, how she pulled together so many projects in a publication without much experience. And if you do too, Garance! I don’t believe how disorganized you claim to be. I have a feeling you are just in the closet about your habits :) indulge me! Great interview! I’m really enjoying these profiles of interesting career women who’s paths haven’t been so typical! Merci beaucoup Garance. I like these Career Girl stories. They are very empowering and educational. I first met Caroline NYFW SS12 when I top her photo for my blog but then I realized how big she was after. I’m glad she is so grounded, intelligent, and has a food balance of Internet presence. She is always dressed so great of course I’m so glad she is do so successful and it’s helpful to see where she comes from. Also fun that she’s asian. Wonderful Garance. Thank you for sharing yet another great interview. Enjoy your day. Smile loads. such an incredible read! so inspiring to see someone working in such an inter- and multi-disciplinary fashion in the fashion industry…. love to see a young woman who is both stylish and intelligent! I find this so incredibly inspiring given that I might be an artist and fashion illustrator, but I also studied economics and finance at university and have been working in banking for the past three years. Never a bad thing to be business savvy though! Great interview Garance, I am really enjoying these posts. Love this interview. She’s very inspiring. I’m attending Fashion Week for the first time next week and I’m ecstatic for my invites. Hope to see you both there. j’adore cette série “carrières” qui est non seulement passionnante mais surtout très motivante. J’ai d’ailleurs des suggestions quant aux prochains sujets : Eva Fontanelli pour les stylistes et Ambra Medda, qui a un style dément et qui organise des choses très intéressantes avec Fendi. Once again very interesting and inspiring! Dead smart young lady. The best fashion comes from those whose life does NOT revolve around fashion. Other aspects of their life color, inform, and flesh out their aesthetic! Est que vous avez des stagiaires dans votre bureau et si oui comment peut on vous faire parvenir un CV ? Ah oui quel parcours dis donc !! Il y a combien d’années qui la sépare de la fac ? (Question tacite : mais quel âge a-t-elle cette fille sublime ? Et d’ailleurs, Garance, est-ce que ce serait tabou de communiquer leur âge ? Je suis sûre que ces ‘career girls’ l’assument pleinement, non ?). Merci pour cette interview qui m’a permis de découvrir Tank! Je trouvais déjà que Caroline Issa avait l’air sympathique juste en photo, et là d’avoir un aperçu de sa personnalité, je peux dire que j’aime bien cette fille! C’est motivant. Moi aussi, j’ai étudié dans grands écoles au Mexique, en France et Espagne, mais des fois on se trouve avec un panorama pas du tout clair. Félicitation à Caroline et à toi, Garance, pour impulser du talent. Merci beaucoup Garance , car il y a quelques semaine je t’ai demandé si tu pouvais demander aux professionnels que tu interroge , leur parcours scolaire , et tu l’as fait , merci beaucoup , et sinon interview super , personnage super intéressant :) <3 . Ca remotive bien ! :) belle carrière ! Merci pour ces interviews Garance!! C’est inspirant et me donne des ailes pour faire évoluer ma carrière! I’m always a huge fan when you get to interview people with interesting career paths. I guess for creatives, it’s always intriguing to see how others do it. You can buy Tank at WH Smith on Rue de Rivoli! Super interview, vraiment intéressant et …motivant!!! En revanche, je n’ai pas compris qui était ou ce qu’était SI New house … une sorte de mogul? 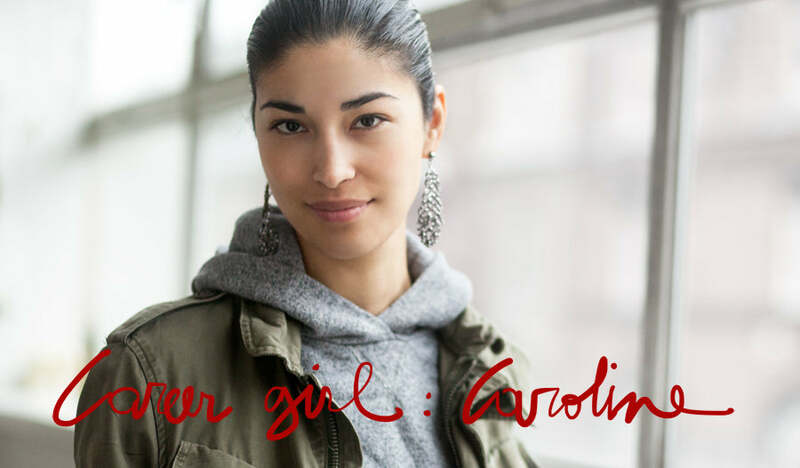 A quand un “Career Girl” sur Garance ? Je n’ai toujours pas bien compris ce que vous faites, au Garance Doré Studio, justement ! wow! being into business/economics and fashion myself I’ve found this interview superb. And Caroline Issa is just as cool (& pretty!) as you can get. Super Garance, merci pour cet article qui fait bien le tour du parcours incroyable de Caroline, comme quoi le rêve est possible encore un exemple du self made woman!!! Jusqu’à mes 16 ans, j’ai toujours été fascinée et admirative du monde de la mode. Je voulais tout apprendre sur le sujet, connaître la “signature” de chaque grand couturier et styliste et être incollable à propos des “It Girls” et des nouveaux visages de la mode. Mais, par la suite, j’ai connu des personnes très engagées politiquement et pour qui la mode n’était qu’un “délire bourgeois”. Ces personnes qui m’agaçaient tellement avec leur discours moralisateur, m’ont tout de même fait énormément réfléchir sur la question. Les vêtements, les accessoires, les produits de beauté, tout cela n’est-il pas tellement superficiel ? Je sais que la question a été à maintes reprises débattue. Mais, il est vrai qu’il est assez injuste et terriblement égoïste de s’inquiéter pour telle robe que nous n’aurons pas, ou de s’émerveiller pour des chaussures Blahnik alors qu’on sait que de graves problèmes persistent dans le monde. Ce n’est pas en consommant toujours autant que nous contribuerons à aider le plus grand nombre. Ton blog est vraiment très inspirant et il est vraiment très drôle! Mais, je me demande comment tu fais pour parfois ne pas te sentir coupable de n’être qu’un acteur dans la mondialisation et la société élitiste et consommatrice. Je ne veux surtout pas te blâmer, car, moi aussi je participe tout autant à cette société de consommation, et la mode me reste très chère. Je sais que désormais, beaucoup de marques font des vêtements bio, mais cela est-il suffisant ? La blogosphère est tellement importante, avec les conseils sur les vêtements, les conseils sur la vie quotidienne, sur les produits de beauté etc… que finalement l’effort des différentes organisations pour l’environnement, l’Humanité est écrasé par son poids. Toi qui as un blog mondialement reconnu, ne penses-tu pas que les blogs se perdent dans leurs “délires bourgeois” et vont à l’encontre de ce qui est réellement important et grave ? Je ne veux pas avoir ce même discours trop moralisateur de mes amis, je souhaite juste avoir ton avis, et être éclairée sur la situation. Je sais que tu en parler plus d’une fois, mais j’aimerais savoir comment tu as su que la mode était devenu ta passion et donc plus qu’un hobby. Je crois que je voudrais vraiment travailler dans la mode, mais pas en tant que styliste ou model, non je voudrais travailler à l’extérieur de la mode, mais toujours dans la mode. Cela semble confus, mais ça l’est aussi dans ma tête. Et je suis dans une étape très importante pour mon avenir : je passe le bac cette année, et je dois donc choisir mes études supérieur. Pour être sur (et peut-être par lâcheté) mon choix ce porte sur le commerce… Pense-tu que j’aurais toujours une solution pour retourner vers mon coup de coeur : la mode ? Wow, je suis vraiment en admiration devant les gens aussi passionné et honnête. La prochaine fois que je suis à Londres, gogo Tank magasine! I love these career posts, they’re very inspiring. Caroline seems like a real go-getter, it’s great to read that about the adventures of people who weren’t afraid to take any risks in their career. I am totally inspired by this post, your career posts are my absolute favorite! Please keep them going, it’s my favorite topic – what people do with their days. I love my days and sometimes feel a little guilty about just how much I love them. I little part of me thinks enjoying what I do so much makes me lazy, so I appreciate the insight into other peoples creative days. Add a little bit of retail/shopkeeper careers?? So interesting to see her journey, and so inspiring! Thank you! As an international business student from Montreal who has already made the transition from science into business for my university years, I truly find Caroline’s story inspiring and I can really relate. I love business because it is so flexible, but it is that same vastness that frightens me. I have a year to go in my degree and would love it if you could ask Caroline whether I should grab life by the horns and start my own business right out of school, or if it is better to gain some experience and then try it out. I also want to thank both you for the interview and Caroline for her life story and for showing me that a creative/rational mind, a mind that lies somewhere in between, has its place in the work force :) and can be successful. P.S. Est-ce que Caroline parle francais aussi? Et comment a-t-elle reussi a etudier a une ecole de gestion si prestigieuse? I adore this post ! Since I am a Finance and Actuarial Mathematics student at the University and dream about becoming an Interior designer, I need somebody from day to day to inspire me, to keep telling me not to quit my dream and try reaching that second bachelor degree in design ! Thanks for this wonderful post, Garance ! She is so beautiful and her style is lovely! Very good interview, thanks Garance. Love this interview. Caroline is amazing. J’avais déjà remarqué tes nombreuses photos de Caroline que je trouve très belle et très élégante. Et maintenant je vois qu’en plus elle a l’air d’une femme passionnante ! It is always so inspiring to read about your career women.. For some time now, I can’t get rid of this dream that is just growing bigger and bigger in my mind.. – To become a writer for a magazine. Not for fashion, in particula,. but to get the chance to write about cities, trends, ideas, street art. I know, writing is one of the things I feel confident in, but to actually have the courage to go out there and try it, fail and try even harder scares me. An interview with a strong and interesting writer – that never gave up – and her way to where she is today would be very inspiring and maybe somewhere I find that last push to do it myself. I love your blog Garance! I get really inspired by the beauty in your photos and drawings and you come across as a beautiful, intelligent and genuine person. My 12-year-old loves fashion and design and so I’ve been sending her these interviews to give her ideas and inspire her. Thank you for filling a need most major fashion mags just don’t seem to get …. Thanks for featuring Caroline, I always see her in the street style blogs and wonder who she is I guess she has that look that makes you wonder who she is. And your interview is a great introduction so thanks for featuring her. She mentioned Tank representing brands…would it be possible to get some examples of the brands they represent…are they interested in newer emerging brands. I love this series! It is so inspiring to hear all of these stories! Her comment about celebrities really struck me. I think it is really sad in America that we have such a limited view of celebrities that’s confined to “beautiful people” who often live very ugly personal lives. I would love for more American magazines to champion opening up what it means to be a celebrity to people who are not just beautiful but truly interesting, genuine and talented. Thanks for sharing Garance! I’d love to hear the stories of some artists/architects! I love the Career Girls segments you do. They are fascinating, educational, unique and inspiring! Keep up the great work. What a great interview, I have always wondered what these familiar faces do?! Tank is one of the most avant garde and brilliantly illustrated, well edited magazine around…it has been my fav. for years. Would love Carolin to take a look at my blog and critic but I am sure she is far too busy. I’m just so jealous of her job!! Congratulations for such and inspiring interview! She is fascinating. I love her look. Very dramatic and cool. Excellent interview- she has wonderful brows! (Je me excuse pour mon français… Je suis brésilienne). j´ai aimé cet interview! Congrats! Vous faites des très bonnes questions: autentique, spontanée, sympa, humble, intéressant – comme vos êtes, en fait! What a wonderful post! It’s really fantastic to hear the story of someone who took a very non-linear career path. It’s always inspiring to hear about someone who followed their passion. I have a question – the financial/consulting community tends to dress very conservatively, especially compared to the fashion community. Back in the day, how did you (Caroline), someone who is passionate about fashion, cope with the conservative dressing? Did you feel restricted as to what you could wear to work? Or did you just break free and wear things you wanted to wear? What were your work essentials, for example? Thank you for featuring such an amazing woman Garance. @Elena.N … many Thanks ! merci à toutes les deux :) ! Je me rappelle la première photo d’elle sur ton blog, où tu disais “who’s that girl?”, attirée par sa beauté incroyable, sa sérénité et son élégance. Depuis j’ai observé avec le sourire votre amitié naissante, et c’est un vrai plaisir d’en savoir plus sur sa carrière, d’autant plus que j’aime beaucoup BecauseLondon découvert grâce à Géraldine ! Moi-même ai actuellement un job bien payé mais absolument atroce, et je voudrais me lancer dans le journalisme culturel (entre mille autres projets notamment dans l’entrepreneuriat). C’est de cela que j’aimerais que tu nous parles, même si tu nous as déjà raconté ton propre parcours : comment trouver sa vocation ? Comment équilibrer le besoin d’un minimum d’argent (appart bouffe ciné) et celui d’un job épanouissant (pour moi, ça inclut écriture, imprévus et contacts humains) ? L’idée de rester encore un mois de plus dans mon job actuel me déprime, et pourtant je n’ai pas la ressource pour me lancer sans filet ! Si tu pouvais interroger Caroline ou d’autre “career girls” sur ce saut dans le vide et comment elles s’en sont sorties, ça m’intéresserait énormément. Indeed, an inspiring interview! I love to hear this kind of stories, extremely motivating!!.. Waiting to meet more hard working girls!! xoxo, Rosie..
J’aimerais savoir si elle revient à Montréal et si cette ville, si créative, l’inspire personnellement et dans son travail. Vraiment génial, merci beaucoup Garance! Etant étudiant, c’est vraiment pas facile de s’y retrouver, mais ce genre de post m’aide beaucoup (genre plus que 3932 conseillers d’orientation à la con qui tapent ta demande sur google), c’est vraiment inspirant de voir que des gens réussissent comme ça! Sinon, elle conseille quoi aux jeunes qui veulent ce genre de carrière ahah? such an inspirational post! thanks garance! Thanks Garance! Always great reading about other people’s career journeys. Caroline sounds lovely. And inspiring! De toute les interview carrière que tu as fait jusqu’à maintenant, c’est la première qui me parle, qui m’accroche. Son boulot a l’air passionnant. C’est génial, parce qu’on dirait qu’elle a trouvé l’équilibre parfait, elle aime la mode sans vraiment faire partie de ce monde que tu nous montres et qui paraît par moment si loin de ce que nous vivons, moi dans ma petite vie d’étudiante de 17 ans, et toutes les autres dans mon cas. L’équilibre donc, parce qu’elle est très cultivée sur divers registre, qu’elle a du avoir tellement de courage pour ce lancer dans tout ces projets super intéressant, et les faire marcher apparemment avec succès. C’est super inspirant. Et moi qui ne connaissait pas Tank, je meurs d’envie d’aller le découvrir de ce pas. Really inspiring interview. Especially for those of us in the business world with artistic passions. I was once a lawyer, a medical sales rep, a medical researcher, and am now writing and editing for Peut-Etre magazine, so I find this infinitely inspirational! I have long admired Caroline, and now, even more so! THANK YOU! I’m applying for internships right now, ho boy. This was what I needed. I will most definitely be pursuing Tank — Caroline’s exactly the sort of person I’d love to learn from. Non, mais…Elle a les cheveux frisés????? Seriously ??? Au delà de ça, j’aime tellement les profils atypiques, c’est tellement rare, une bouffée d’air frais!! I like her “big picture” perspective. Being involved in different facets of life makes us better at each individual area. And she has great style. She is so amazing, a great interview Garance! Please let your next career girl be Taylor Tomasi Hill. Please. Pretty please? Ouaw Elle est si “inspiring” (je trouvais qu'”inspirante” c’était pas génial)! Thank you so much for this interview, Garance! I absolutely love Caroline; she’s an utter inspiration, from her beauty and grace and intelligence to the fact she’s followed an unusual path (for the fashion industry at least) and that this has given her and her magazine such depth. I love Caroline’s style and she is a really inspiring figure because she is so hard-working! I loved to hear about how she became fashion director and publisher at Tank- it is so interesting and goes to show that there is no fixed career pathway in the fashion world- just to work hard and be brave! I have a question about her job at Tank because being publisher of a magazine is totally different to fashion director, how does Caroline combine these roles? Merci pour l’entrevue avec Caroline, j’ai beaucoup apprécié car je suis moi même dans le même bateau, présentement en finance pour l’Oréal et je suis a démarrer ma petite entreprise de confection de vestes Mode faites a Montréal avec ma soeur Rim. J’aurai une question a toi et Caroline, quel est selon vous le plus grand avantage d’avoir de commercialiser des items de mode fait au Canada? I really love the career interviews!! I really want to be a stylist one day and would really appreciate a career post on someones journey into styling.